This week I wanted to paint a winter-y nail design and show you all how to do this bird nail art as well. A cardinal is a beautiful bird that represents winter, so I thought I would try to do a design with a cardinal on my nails. 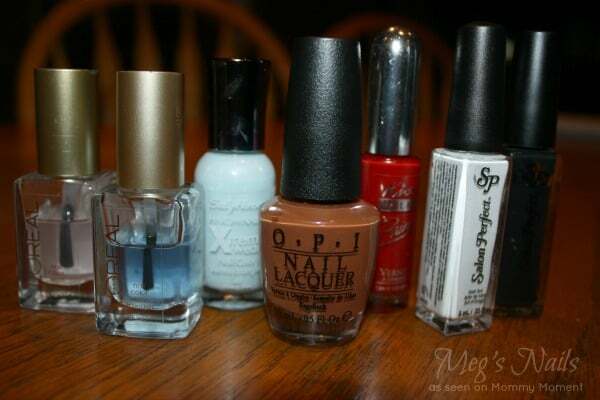 These are the polish colours I used, however, you don’t need these exact ones – any colour close to these will do. First I took the light blue colour and painted two coats on my nails. Then I took the brown and painted on the branches. I wanted to paint the cardinal on my index and ring fingers so I made those branches closer to the bottom so there was room for the bird to perch on top. If you don’t have the shade of brown you want in a thin tip bottle (like me) you can just use the brush from one of you other thin tip bottles and clean it off when you’re done. 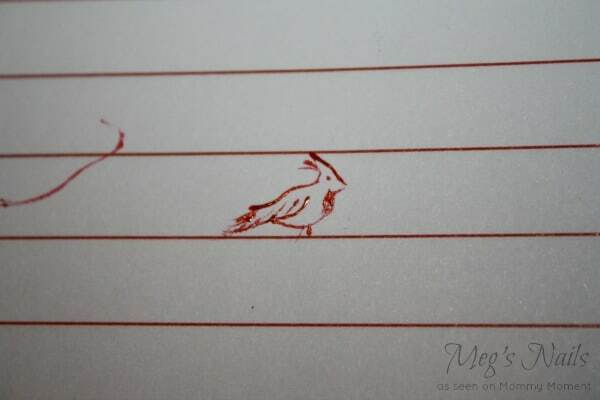 If, like me, you haven’t painted a cardinal before, I recommend taking your red thin tip and painting the bird on a piece of paper first so you get the hang of it. 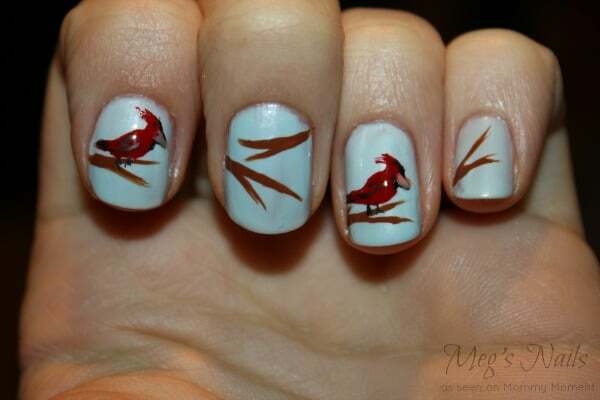 Next, paint the outline of the bird on your nails with your red thin tip. Then, with the same colour, shade in the birds. Next, take your black thin tip and outline a few parts of the bird like the wings and a bit around the beak. Take your white thin tip for the next step and add some snow to your branches to make the design more winter-y. To make the beak, I mixed my brown with the white to make a lighter brown and then painted it on the bird’s face. Let me know if you try this nail design! 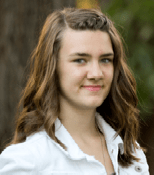 Megan is a 15 year old student, in grade 10. Her passion for nail art started at around age 11 but she never got into doing designs until this last summer when she and her family moved to Steinbach. 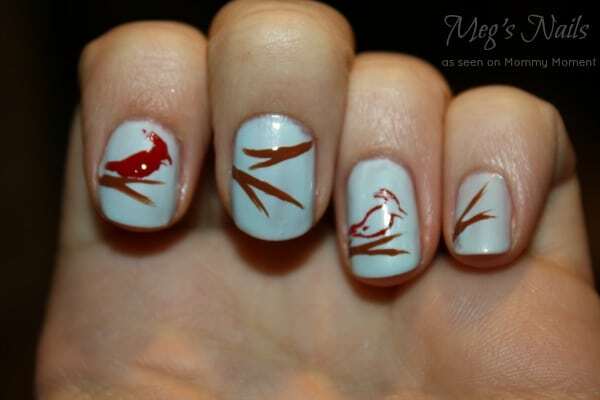 Megan loves trying new designs out on her nails and sharing them with the people around her. She would love to pursue a nail career after grade 12 and enjoys having her own private ‘salon’ (Meg’s Nails) in her basement while still in school. Your nails turned out super cute! That’s a great DIY tutorial! Sooo beautiful. Those nails would match my room. okay this is way too artsy for my. I’m lucky if I get a single coat that my daughter applies for me. 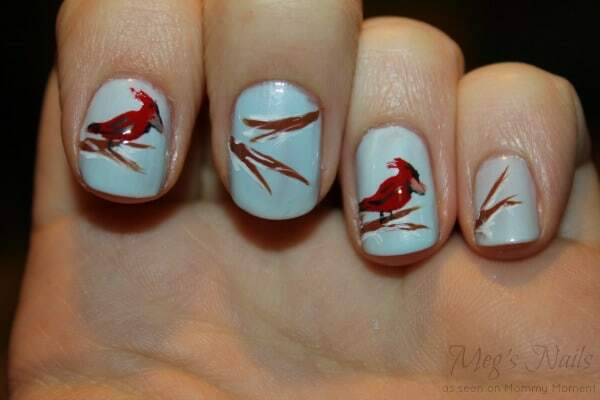 but I really would love cardinals on my nails. that would be awesome. You make it look so easy…wonderful instructions. I really love this design…perfect for Springtime! That’s crazy good! I’ve tried just to do lady bugs on my own before and failed miserably! It always looks so easy when someone else does it but you definitely have a talent for it. Very cute. I really like the idea of the bird and branches. Amazing, Perfect design for the winter months! Wow that is amazing, I have enough trouble making my nails look good using just one colour, lol! Great job meg you are amazing at nail art! So cute, you did a fantastic job, much better than I could do. I love the blue basecoat. I’d love to try this but know I’d make a hash of it. And my birds wouldn’t resemble anything found in nature. what a fantastic job Megan did on these nails. I can’t believe that she created the cardinals as easily as she obviously did. If I tried that everyone would just think I’d smudge the varnish! I think Megan has a great future in this line of work, well done Megan. Wow how awesome!!! I finally have long nails after 42 years of biting! I am just beginning to learn nail art.. I can’t draw worth crap so this is gonna be fun! Very nice, just a bit outside my comfort zone. my daughter would love this, cute nails. 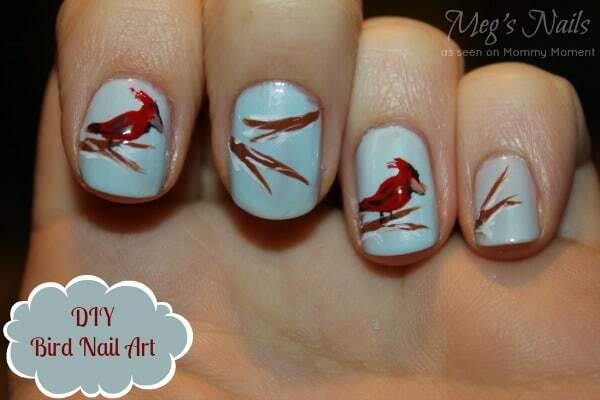 The Cardinals are my favorite baseball team, would be fun to put the design on my nails during baseball season. this is so pretty, must show this to my daughter .she would really like this !!! Wow, that design is adorable! I do not have the dexterity for those cute little designs. That is super cute – thank you for the step-by-step! Great idea to use the thin brush from another colour…for some reason my brain would never have thought of that! Very talented and creative. This looks so good. I could never do my nails because my hands aren’t stable enough, not to mention I’m not ambidextrous. I’d only be able to do one hand.